A contractor is defined as a construction firm, performing work as either a prime or subcontractor in the heavy, highway or utility construction business in Kansas., Only contractors who are engaged in the construction business and have established a reputation for skill integrity, and responsibility, may be considered for membership. A contractor may be an individual, partnership or corporation that contracts to perform construction work and has been in the contracting business two or more years. Membership shall be held in the name of the individual, partnership or corporation applying. 1. Complete the Contractor membership application and submit to KCA. Membership applications require KCA Board approval. Base dues for contractors is $1,500.00 for KCA chapter membership. Only the base membership fee is due the first year. After the first year, and each subsequent year, dues are a combination of the base fee and a modifier calculated on the volume of work a contractor performs in Kansas. These dues include your membership in the AGC of America. KCA pays an annual fee on your behalf that provides this membership and entitles you and your employees to take advantage of the many member benefits available through the AGC Affinity Program. Check out these benefits at AGC Affinity Program here. The second year and each subsequent year, Contractors will pay $1,500 to join and then the following year will pay a $1,500 base with a modifier of .0015 x their volume of work in Kansas with a $20 million dollar cap. For example: $20,000,000 times .0015 equals $30,000 plus the $1,500 base for a total of $31,500. Download and complete the contractor membership application here. 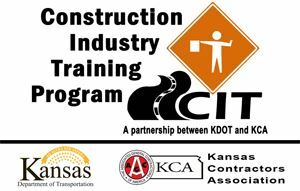 The Construction Industry Training program is a partnership between KCA and the Kansas Department of Transportation (KDOT). Most courses are offered during the winter season when contractors prefer to schedule training. Public or custom/in house training is available. If you are a contractor or subcontractor for KDOT, you probably have tuition credit available to your employees. Contact the Kansas Contractors Association to see if your company may take advantage of this program.